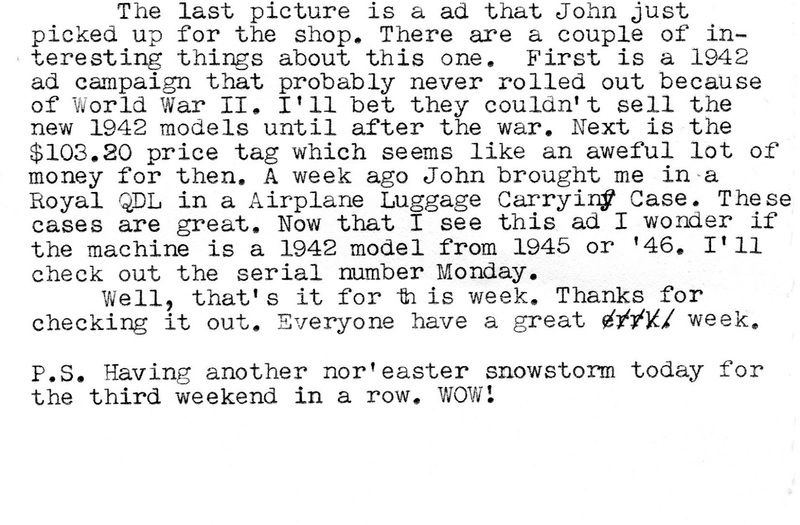 Life in a Typewriter Shop: Don't EVER Do This! This is a very sad sight. This QDL is beautiful but smelled like a open can of gasoline. I find many interesting home repairs on these older models. Oh no, that Royal brings back bad memories of trying to get the carriage of a Royal Signet back on! (Basically the same design, but caps-only.) At this point I can't remember why I was so silly as to take the carriage off, or maybe that's how it got to me. The ball bearings are such a pain. I wonder how they handled that part of manufacture at the factory. Nice work on the red QDL and the Remington. 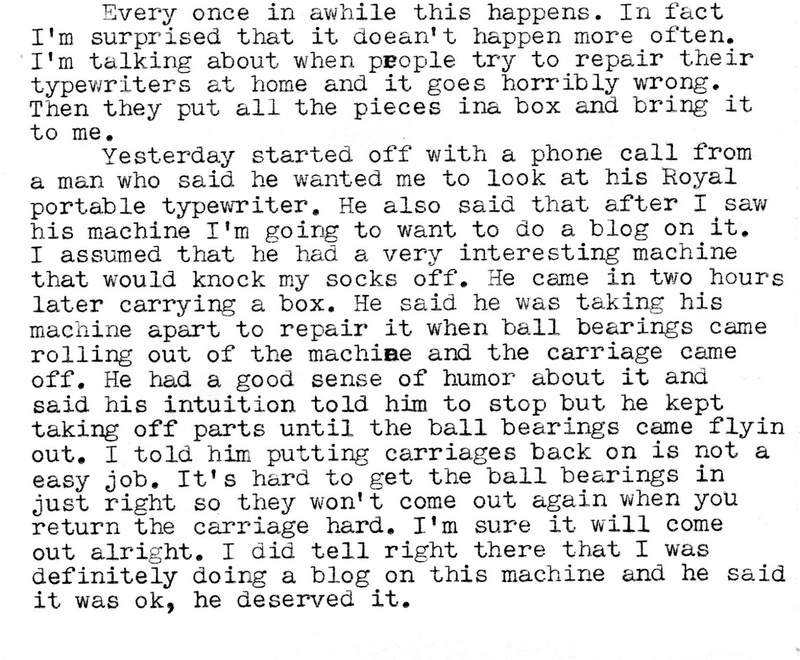 I'm glad someone has the stick-to-it attitude to put the balls back into a ball bearing carriage. I have yet needed to do that, and I hope I never do. Then I may try it when I have a day with nothing else to do with an old junk carriage I have for parts. Ha! Okay, now I feel a lot better about myself. Because no matter how badly I've buggered repairs, I certainly haven't shotgunned ball bearings all over the room. I can push myself to tinker on a purely intuitive level, but generally, my rule of thumb is "don't take on a job you are not qualified to perform." If it looks too big an issue, I'll leave it to the experts. The red QDL is very attractive. But hasn't the previous owner heard of that miraculous potion PB BLaster? Well, it also has this powerful chemical smell but at least it clears up within a week. 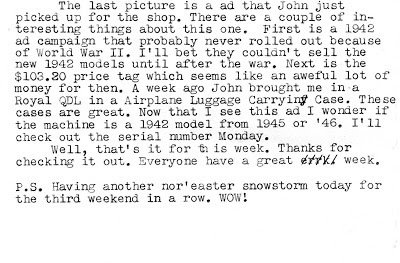 Richard- Thanks for the comments. 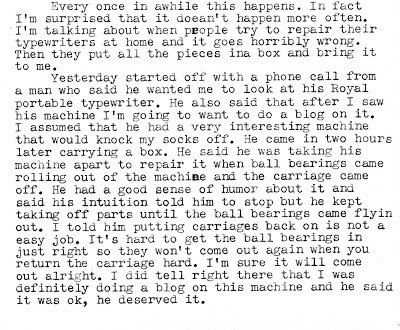 I'm sure many people have regretfully taken the carriage off their machine. I haven't done that but I've had several shooting ball bearing incidents. 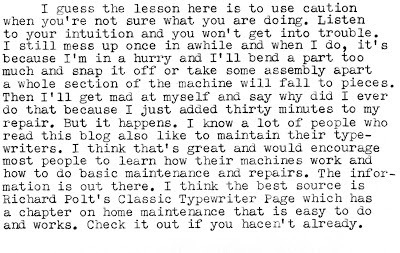 What I wouldn't give to meet a old typewriter factory assembler and pick their brain for an hour or two. 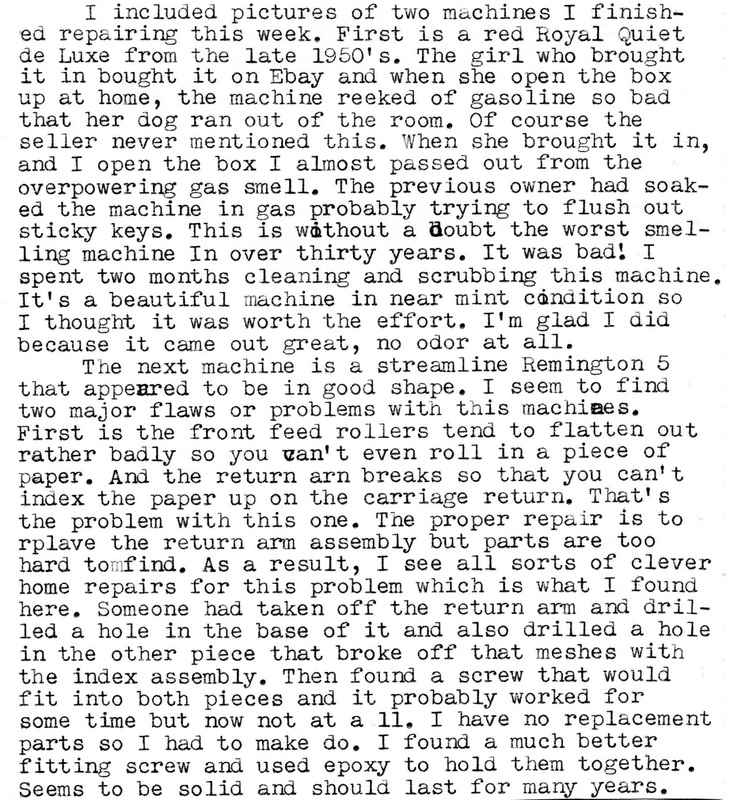 Bill- You can really learn a lot by stripping an old junker and see how everything goes together. 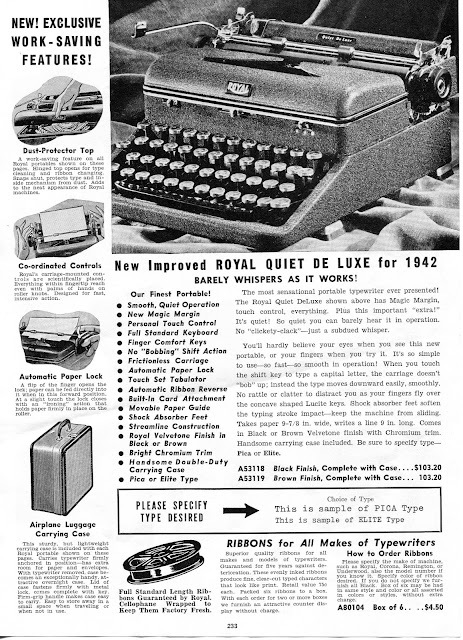 I would love to have seen one assembled at the factory. Thanks. Mike- Thanks. I could write a book on botched repairs jobs over the years. Sometimes that's how you learn. Two years ago I messed up Abraham's L-32 so every time he returned the carriage a ball bearing would go flying out. We still refer to it as the flying ball bearing incident and laugh. Ton- most people haven't heard of PB Blaster. I've been recommending it to customers to use at home for home repairs. I can't use it here because of the smell. Thanks. Ha! When you said "someone with a Royal portable home repair gone wrong", you might as well have been referring to me. 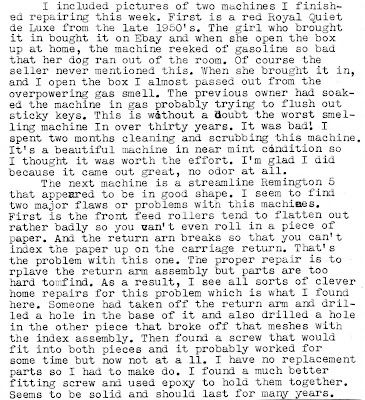 When you got to the part about shooting the ball bearings out, I thought perhaps someone had been spying on me, as I too shot my bearings out just last week trying to fix the carriage (good spring tension, but no movement when pressing keys). A little patients and examination of the situation and everything came back together okay. Now that I have a technique (and had to get them back in like 5 times over the course of the day), I'm no longer terrified of the prospect, and have full range of motion of the carriage! 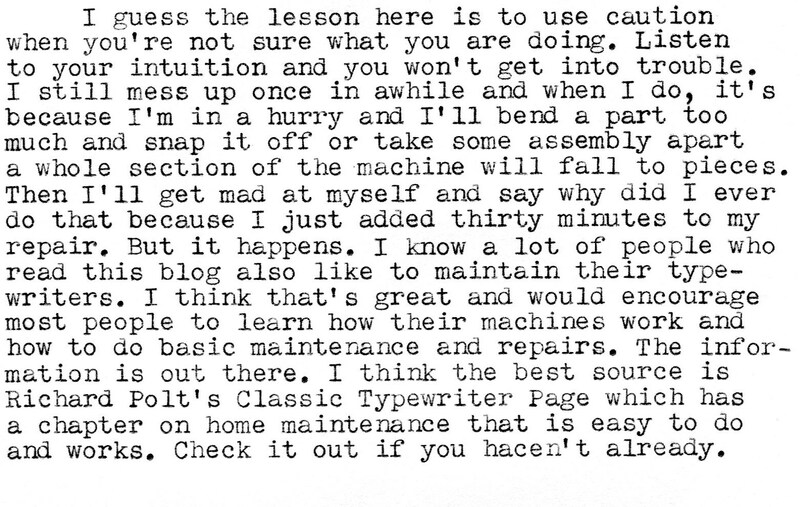 If owning an old typewriter teaches you nothing else, it really helps you to learn your limitations. Spring is on the way!